Learn how to find products to import and then do the research to find out whether you can sell them in your local market. What legal form is best for your business? Don’t forget to register for sales taxes and protect your trademarks. Consider operating your business from your home or by leasing commercial space. Look at some of the advantages of warehousing and bonded warehousing. You’ll learn about the most popular ways of paying for imports and some of the companies that are involved with trade financing. Take a look at some of the freight alternatives for importing your goods and what’s involved with customs clearance. This book will show you how to use advertising and direct marketing to sell your imports. How to advertise them by setting up your own Web site and how to sell them using e-commerce software. A full chapter will discuss the topic of fulfillment–how to get your imported products into the hands of your purchaser. You will be provided with all the basic knowledge you need to start your own importing business and how to make money selling the products you import. 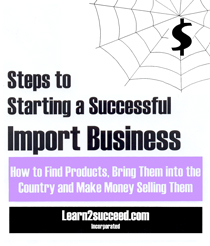 Steps to Starting a Successful Import Business: How to Find Products, Bring them into the Country and Make Money Selling Them by: Learn2succeed.com Incorporated: softcover; 148 pages; ISBN: 978-1-55270-358-8; published in 2009; $24.95.